We have put together a list of the competitors in the snow shoveling app industry. 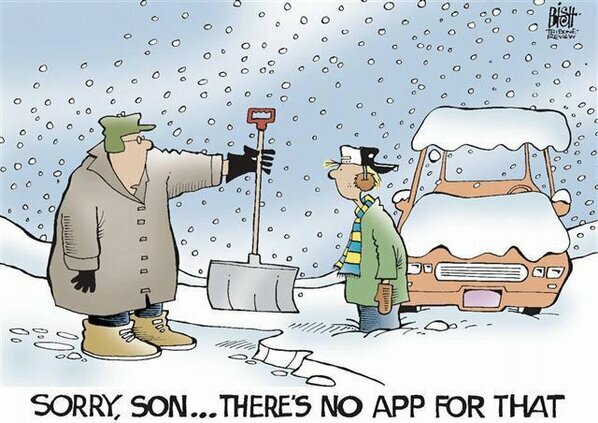 Snow removal apps included are Shovler, Plowz & Mowz, TaskEasy, Eden App, and Lawn Guru. We have excluded apps that are only in Canada such as TouchPlow, SnowMowr and MowSnowPros. We also did not include any apps that have not been released or are not functional based on app store reviews. Pricing. On most of the other apps, you have to wait until someone bids your job and gives you a price. On Shovler we offer a one-tier price for all cars and homes. We do this because it is simply the easiest way to hire a snow shoveler. No need to negotiate prices. No need to wait until you receive a price bid. Yes, this means that in some cases you will pay $5-10 more than you would have if we measured everything to the square foot. We believe that our customers care more about the simplicity of ordering rather than saving a small amount of money. Method snow removal. Most other apps offer plows on demand. Shovler offers snow shovelers on demand.Although plows can definitely do a job quicker than a snow shoveler, the fact that there are fewer than them means that the time to get a plow to your house is usually significantly slower than ordering a snow shoveler. There just aren’t that many plows around so the wait time for them to get to your house can take a long time. Anyone who has had a service contract with a plow company can attest to the frequent complaint of customers only having a plow reach them 24 hours after the snow fall. Snow shovelers on the Shovler are asked to only accept jobs once they are ready to do them and that they should arrive to the job within 15-30 minutes. It may take them longer to do the job, but in the end, the job will usually be done before a snow plow would even have reached your home. Other negatives of plows relative to snow shovelers is that it also increases the possibility of damage to your driveway, some plow companies don’t offer sidewalk and walkway clearing, and if your car is parked in the driveway many plow companies will just skip that whole area. Car shoveling. One of the most unique features Shovler offers is the ability to hire a snow shoveler to dig out your car even if you parked on a city street. You simply show on the map where you parked with your car model and license plate and a snow shoveler will remove enough snow to allow you to exit the parking spot. Try to do that with a plow! Thank you for your interest in becoming a snow shoveler on the Shovler platform! Below outlines the steps required and it should take less than 10-15 minutes complete. While signed in as a shoveler, go to Settings –> My Info & Settings, and then hit the Connect with Stripe button. If you already have a Stripe account, you can sign into your account to link it with Shovler. If you don’t yet have an account, you can sign up by filling out the forms shown below. Please note: The Connect with Stripe button can be slow due to connecting with Stripe’s servers. If you see a white screen after clicking Connect with Stripe, please wait up to 30 seconds for the page to load. Signing up is extremely straightforward and you’ll be able to start accepting jobs immediately. IMPORTANT: For your website address, if you are a snow removal company you can use your website address. If not, use shovler.com. For your business mention that this will be for snow removal using the Shovler App. For your business name – use Shovler.com or Shovler Inc. If you do not fill out your account correctly there is a chance Stripe will flag your account and delay or prevent payments to you. Please make sure to answer and respond to any emails that Stripe sends you and fulfill any verifications that they require. If you have any questions or issues please feel free to email us at admin at shovler.com or reach out to Stripe directly (support@stripe.com) if you have any questions about their platform. Transferring money from Stripe may take longer on the first time that you transfer money than usual. Now that you are officially a snow shoveler on the platform you should also consider buying a new snow shovel and some salt! One of the most frequent questions we get is why does Shovler only focus on snow removal and not diversify into other businesses such as lawn care like other mobile apps have done. The main reason is that we believe you have to stay focused on one problem if you want to be successful. Once you start trying to do lawn care too you lose focus on snow removal. Is the snow removal industry large enough to be worthwhile to solely focus on? We believe so! In May 2016, the Snow & Ice Management Association (SIMA) released a report that the commissioned on the size of the private snow and ice removal market across the U.S. The size of the private snow removal market in North America is estimated to be $22.7 billion ($18 billion U.S. / $4.7 billion Canada). Residential accounts for 34% of the private snow removal industry. The North East (New York and up) is the largest market in the U.S. accounting for 27% of the industry, followed by the Great Lakes area 25% and then the Mid Atlantic 15%. New York is 13% of the market itself. (If we do the math, New York represents about $3 billion). Snow removal industry is VERY fragment – the top 50 operators account for just 1/12 of the industry’s total revenue. 80% of industry operators are sole prorpietors! Operators’ most commonly used pricing model is variable, as just 1 in 5 contracts are seasonal. Specific types of variable price models used vary widely: 29% of contracts are per-push, while 23% are per-hour, 17% per-season, 14% per event and 14% per inch. Operators only spend 4% of their revenue on marketing. The best news for SIMA and the S&I field is that the industry is growing by about 3.5% annually, and that it is on target for continued growth through 2019. When you take into account that only 85% of households have plow contracts (I heard that number somewhere but could not find a place to verify it yet…), a good portion of those people are paying their local neighborhood snow shovelers. This report didn’t take into account this underground economy but I don’t think it would be crazy to estimate it was above $10 billion itself. So when you take all these factors into account, snow removal is a pretty gigantic business. It just suffers from major logistical inefficiencies that were trying to improve at Shovler. The vision is that the mobile app Shovler becomes THE place for people to put on their snow removal requests and that all operators and neighbors can log on and accept whatever jobs are closest to them on-demand. We need your help growing this business so please tell your friends about us this upcoming winter! Before you try to shovel snow by yourself, remember that the dangers of shoveling snow are real especially for anyone over the age of 55. A study from the Center for Injury Research and Policy looked at data from 1990 to 2006 and found that there were 1,647 fatalities from cardiac-related injuries associated with shoveling snow. Cardiologist Barry Franklin, director of preventative cardiology and cardiac rehabilitation at William Beaumont Hospital, Michigan and an expert in the hazardous effects of snow removal, considers snow shoveling to be so dangerous that he advises anyone over the age of 55 not to do it. Watch for warning signs of a heart attack, lightheadedness, dizziness, being short of breath, or if you have tightness or burning in chest, neck, arms or back. If you think you are having a heart attack, call 911. One of the reasons Shovler was created was to keep people safe and healthy. Please use the Shovler app instead of potentially risking your life trying to do it yourself. Shovelers that signup to Shovler should make sure to take health precautions and ensure with their doctors that they are healthy enough to shovel snow and be careful of cold temperatures. Take a break for hot cocoa or tea every once in awhile! Weather reports are starting to forecast snow as early as this Saturday in certain parts of the country. Even though it is already the middle of November and we haven’t had any significant snow fall to date, this winter is still predicted to be one filled with lots of snow. In case you missed it, due to El Nina, this winter is expected to be bad. Or I should say: Good for snow shovelers! You can read a more detailed snowfall forecast you can check out this article here: Link. Most of the snow now is predicted to be in Colorado and the north west while Shovler marketing efforts have been on the North East especially New York City and Boston. Snow shovelers are still signing up daily for the Shovler App. If you are considering shoveling snow this winter to earn extra money please sign up now and let anyone else you know that may be interested! Author ShovlerappPosted on November 15, 2016 November 27, 2016 Categories NewsLeave a comment on Snow on the Horizon! We continue to grow the amount of snow shovelers signed up to Shovler! The more snow shovelers we have, the easier it will be for users to find a snow shoveler nearby. We hope that snow shovelers will help in sharing Shovler with their neighbors in order to increase the amount of jobs on the platform. As more jobs are added to the platform, snow shovelers have a chance to earn significantly more money. Especially as the amount of wait time between jobs decreases. The goal is to have at least 250 snow shovelers in New York City this winter. Please download the app now from the App Store and Google Play. Author ShovlerappPosted on November 1, 2016 November 27, 2016 Categories UncategorizedLeave a comment on Snow Shovelers Wanted!